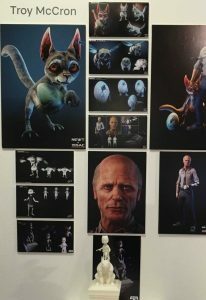 Perhaps more than any other exhibition space in the Degree show, the Animation displays demonstrate all the processes by which the end products are realised, and the extent to which teamwork plays an essential role. The “end products” are stylish, witty short films running in a recently refurbished and comfortable lecture theatre. Sitting in the dark to watch the short films was reminiscent of visiting the cartoon cinemas of old, where one could watch the latest newsreels and “funnies” on an endless loop. 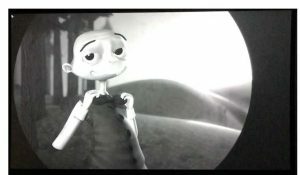 The films on show acknowledge this long tradition, with nods towards the early days of black-and-white subtitled cartoons (Date Fright) and Disney-style fairy tales (Just Sit Still). They also bring that tradition right up to date, fully exploiting the most recent technology. Just Sit Still tells the story of a young princess sitting for her first portrait. Unfortunately, her efforts and those of the artist are undermined by a bluebird who seems straight out of Disney’s early Cinderella, but much more malevolent than Disney’s cute birds. Kevin the Dinosaur also undermines expectations. 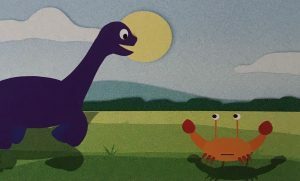 Conceived in a very simple style suited to pre-school cartoon films it starts out happily enough with Kevin meeting a crab. Alas, the resulting narrative presents a bleak and unexpected reason for the extinction of Kevin and the rest of his species. Date Fright has a happier ending; while our hero is abandoned by his date in a scene that nods towards Fay Wray’s kidnap by King Kong, things turn out more happily for him in the final few frames. Animation is a labour-intensive process, requiring each student to concentrate on one or two specialisms in order to contribute to the finished work. It is as the credits roll that we see the full extent of the co-operation and collaboration that is required in the creation of these entertaining short movies. Directors, storyboarders, animators, 3D modellers, texturists, voice actors, musicians and more are drawn from the team of graduating students and a number of additional assistants. One of the most important background skills required by animators is the ability to draw figures from life. Before animating a talking monster or a flying superhero it is essential to know how real bones and muscles work; hence the impressive life drawings on display in frames around the terminals, a tribute to the students’ skills and that of their tutors and models. Finally, not to be missed (follow the signs to “More Animation”) are the maquettes designed by Roisin McCallum. These miniature scenes create a compelling and threatening feeling of foreboding. With the overall title Tales of the North, they are designed as potential sets for stop motion animations. This is a show which impresses and informs while making you chuckle. The animations were fantastic; testament to a wide range of skills and talent. 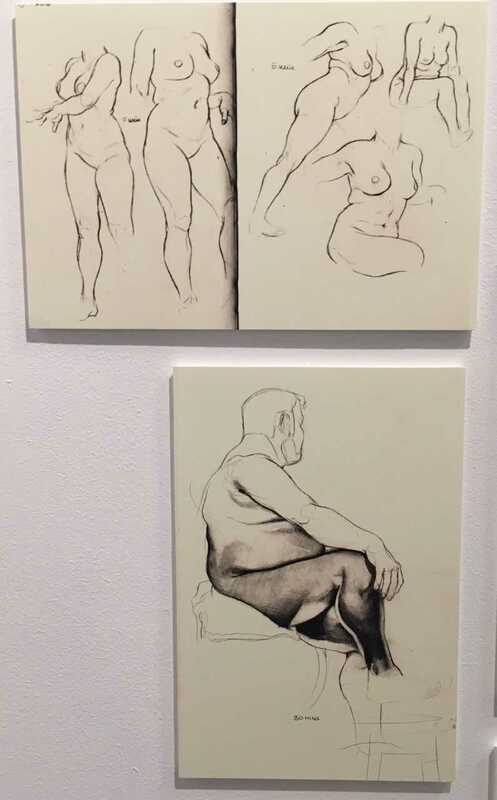 Love that life drawing. Very skilled.